EcoFaith Recovery offers annual Leadership Retreats. These retreats allow us to spend the day embodying some of EcoFaith Recovery’s core practices – leadership development, spiritual grounding and relational practices. What do we do at the retreats? 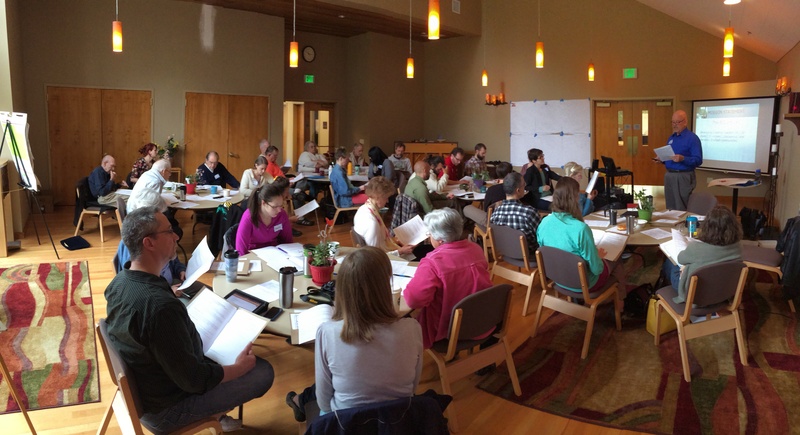 Learn about and offer input into a leadership development model for use, not only within the Initiatives of EcoFaith Recovery, but also within our own congregations and communities! Who Should Come? If you have been active in any area of EcoFaith Recovery’s work (Beyond Fossil Fuels, PCEF, Simply in Season, Organizing in the BioCommons, Preaching in the Biocommons, Internships, Mentoring, etc.) and are interested in deepening your engagement within the work of EcoFaith Recovery, this gathering is for you! To see what we’ve done at past leadership retreats go here.